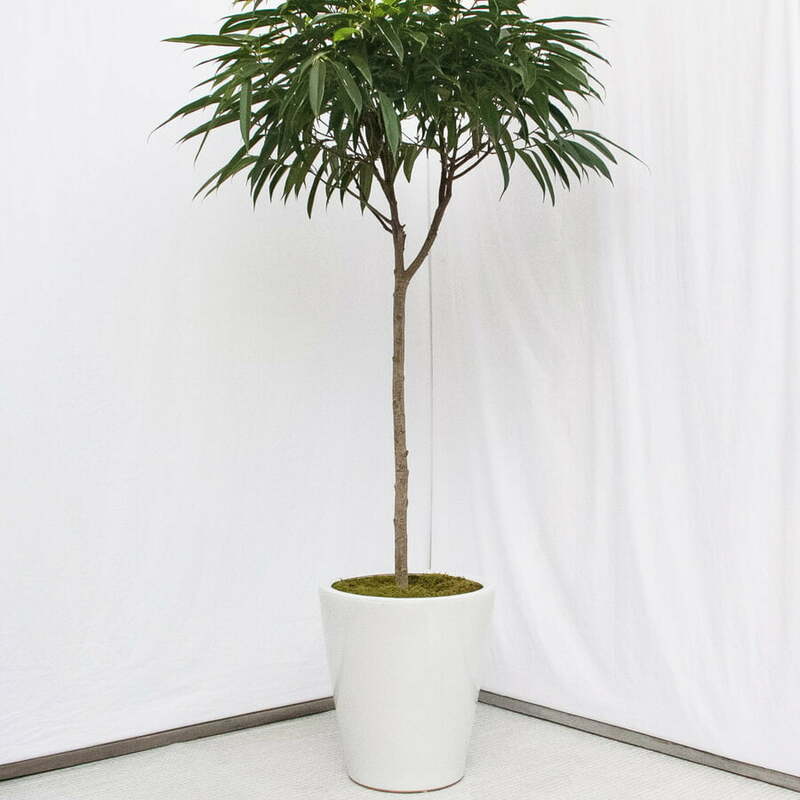 Ficus Alii (Ficus binnendiijkii ‘Alii’) is one of the most popular air-purifying indoor plants. It has slender, long and deep olive-green leaves and are naturally glossy and taper to a point. As the ficus tree grows, it may drop its lower leaves revealing a bare woody trunk, giving this tree a palm-like appearance. 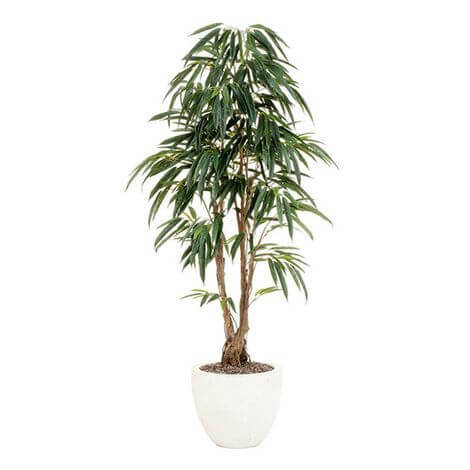 Ficus Alii filters airborne toxins such as formaldehyde, benzene, and trichloroethylene from the environment. It prefers an indoor location with filtered sunlight or bright indirect light. Place your plant at bright east, west or south-facing window. It thrives best in a rich, humusy and well-drained potting mix. It grows well in average room temperatures 60-75°F/16-24°C. Do not allow below 55ºF in winter and keep out of cold drafts. Water the plant when the top 1 inch of soil has dried out. Water regularly throughout the summer and reduce watering in the winter. Keep the soil slightly moist and do not allow the plant to sit in water. Fertilize every other month spring through fall with a balanced liquid fertilizer diluted by half. Do not fertilize the plant in winter. You can prune the plant a little if you think it is necessary to shape it. Always wear gloves when pruning. because the sap contains latex that can cause skin irritations. It can be propagated by seed (Sow seeds in spring), stem tip cutting (make rooted cuttings in spring or summer) or by air layering. It can be rooted from tip cuttings with rooting hormone and use only non-woody stems as cuttings. Mealybugs, whitefly, aphids, thrips, and scale are the most common pests in indoors. Botrytis or Gray Mold are plant diseases that occur when the leaves of a Ficus Alii are kept excessively wet.